Repetition is the mother of skills. I learned this maxim the hard way. The summer before I went off to college to play basketball, I and several others gathered every morning at 6:00am to train. There was physical repetition as well as mental repetition. I can still hear my trainer’s deep Samoan voice: “Repetition is the mother of…” We, not stopping our line drills, wall sits, or defensive slides (the agony!) were to respond: “Skills!” So it went every day. To become skillful in any aspect of life we must repeat it over and over. As a man, I wasn’t born a good husband or father; it takes (present tense) practice—sometimes the hard way—over time. A good husband repeatedly hugs and kisses his wife before they part, reunite, and before they go to bed. Marriage experts would point out the monotony is healthy. When it comes to religion, though, we Americanized Christians don’t want repetition. We’ve been told (ironically, again and again!) that repetition is dead, spontaneity is good; pre-set forms of worship quench the Spirit, laid back services are “Spirit-led.” If we would’ve ever stopped to think about those claims, we might never have fallen sway. Yet here we are, children of evangelical revivalism and pietism. After my conversion within modern evangelicalism I came to historic Protestant Reformation understandings of the Faith. My settled conviction is that a well-thought out weekly liturgy is the best instructor I can offer my people. Good liturgy transcends our particular feelings and leads us to experience the historic Faith with all people in all places. Liturgy is our most capable teacher because week by week we are led into God’s presence to hear his Word and receive his grace while we respond again and again in gratitude. In explaining why liturgy is our best teacher let me first define terms. By “liturgy” I mean the order, acts, words, and ceremonies in public Christian worship. “Liturgy! ?” Let me assure you that it’s no four-letter word. It actually comes from an ancient Greek word, leitourgia, generally meaning any kind of service but specifically religious service. A liturgy, then, is simply an order of the acts of worship. 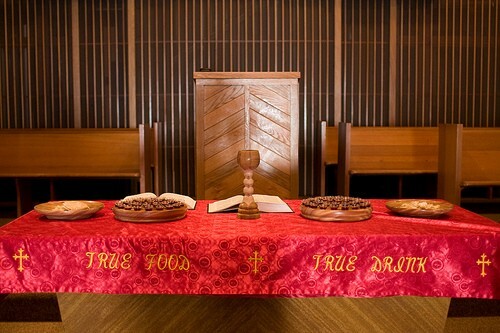 Every church, therefore, uses a liturgy. It’s not something only dead churches stuck in traditionalism use, but something that happens in every worship service in the world whether or not a particular congregation has a more structured or loose service and whether or not its “liturgy” is printed and followed. Even churches that told me, “We just wanna worship the Lord in the Spirit,” followed a predictable pattern the praise team had planned ahead of time. The same is true for worship. The liturgy should be heard from cradle to grave, from birthing bed to death bed. In times of great joy what better words to sing than “praise God from whom all blessings flow?” In times of great sorrow is there anything so comforting as praying, “Our Father, who art in heaven?” In times we’re asked what we believe, how about, “I believe in God, the Father Almighty?” In times of repentance why not cry out, “Lord have mercy on us, Christ have mercy on us, Lord have mercy on us?” Depressed at hearing of Christian persecution? Recite the liturgy: “And He shall come again, with glory, to judge the living and the dead.” The very words and prayers we need are available to us because the liturgy has taught us. Alright, enough of the bad news. What should be in a good liturgy so that we learn about who God truly is? Let’s begin with two overarching principles. Good liturgy includes the corporate participation of all in the church, children and adults. Liturgical worship activates participation. Children can hear, learn, and join in even before they read. A four-year old child can recite the Apostles’ Creed with an eighty-four year old in the local church as part of the church universal. Christianity is not a religion of adults for adults but a covenantal religion. Children are just as much members of the covenant people as adults. God once said he made his covenant “between me and you and your offspring after you throughout their generations” (Gen. 17:7). Jesus said: “Let the children come to me; do not hinder them, for to such belongs the kingdom of God” (Mark 10:14). Paul described children of just one believing parent as “holy” (1 Cor. 7:14). Good liturgy catechizes us to be in unity with the church of all ages. We need to repent of being chronologically arrogant. Jesus’ Church has been around for thousands of years; we didn’t invent its worship. When we sing the Psalms we join the faithful longing for their Messiah 3,000 years ago. When we worship according to the pattern of Word and Sacrament we join the earliest New Testament believers 2,000 years ago (Acts 2:42; 1 Cor. 11), which was passed down by men such as Justin Martyr around A.D. 150. When we recite the creeds we join orthodox Christians for the past 1,500 years. When we sing the Gloria Patri we sing an ancient song from the second-century. When we pray, “Lord have mercy on us, Christ have mercy on us, Lord have mercy on us,” we pray with third-century Christians. So what specifically should a good liturgy include and what do those elements teach us about God, ourselves, and our worship of him? Good liturgy begins with God. Through the reciting of Scripture God calls us to approach his throne of grace. This “call to worship” teaches us that God initiates a relationship with us. He reminds, or rather confronts, us each week that we enter his holy presence not because we’re worthy or he needs us; but because he graciously condescends to invite sinners to himself. While God graciously welcomes us into his presence, we still must remember that we’re entering the presence of him who is a “consuming fire” (Heb. 12:29). Because he’s holy and we’re still sinful, weekly we need to hear his righteous laws, confess our sins; and receive the promise that he’s met the demands of his own righteousness in Jesus. That’s the “gospel” or good news. Participating in this kind of liturgy where we rehearse these truths teaches us that we didn’t save ourselves and that we still can’t. By nature we want to help ourselves. That’s why we need a good liturgy of law and gospel. The liturgy won’t allow us even a nibble of the “turkish delight” of self-help. Good liturgy, then, strips us naked of what we, by nature, want and gives us instead what God says we need. As God’s redeemed and forgiven-again people, good liturgy leads us in grateful response by declaring by God has done for us in singing. This is why historic Christian worship has always primarily sung Old Testament Psalms. They teach us that praising God is actually telling back to him what he’s already done while simultaneously declaring his marvelous acts to the next generation of believers as well as to unbelievers (e.g., Pss. 66, 78, 96, 98, 136). The centerpiece of good liturgy is actively hearing God speak to us in and through his Word. Hearing from the Old and New Testaments the wonders that God has done for us in the sending of his Son to redeem us teaches us that Christ—not ourselves—is to the One to whom we look for redemption and every other need in life. We don’t only hear this Word read at one moment in the liturgy but as we recite it throughout. Having heard what God promises us in the Word we then see, touch, smell, and taste those promises in the Word visible, as Augustine described the Lord’s Supper. Christian worship follows the general pattern of Israel’s sacrifices: drawing near to God, confession of sins, followed by a communal meal with God. This is the purpose of the Supper: to commune with the people of Christ upon Christ. Good liturgy teaches us that this meal is so much more than a mere remembrance; it’s a sacrament—a participation in a divine mystery. This is why the ancient sursum corda (“lift up your hearts…we lift them up to the Lord”) continues to be at the heart of Holy Communion. A good liturgy will emphasize prayer based on the petitions of the Lord’s Prayer. Everything from adoration, confession, thanksgiving, and supplication needs to be in the various prayers of the liturgy. Since it’s “the chief part of thankfulness” (Heidelberg Catechism, Q&A 116), a prayerful liturgy teaches us to pray together to the Lord and that worship is not about us. Finally, just as God had the first word in worship so he gets the last word, sending us out with his blessing (benediction). Just as our daily lives culminate in gathering for public worship, our public worship culminates in going out from it as a worshipping people. As Jesus said, we are to be the salt and light of the world in the strength of his heavenly benediction. So what does this all mean for you and/or your congregation, even if you don’t use a historic Reformation (Lutheran or Reformed) liturgy? Let me apply the principle that liturgical worship is the best instructor the church has in the Christian Faith with a couple suggestions. Don’t be ashamed of using set forms of worship. Against overly strict versions of Puritanism, set forms aren’t bad nor binding of your conscience if the form is biblical. Against revivalism, set forms actually communicate to the unbeliever what to believe and why they need to believe it. Against pietism, set forms don’t quench the Spirit nor cause “dead orthodoxy;” they’ve been used by the Spirit for ages, communicating what he’s saying to the Church. “But don’t set forms of worship lead to boredom and a lack of enthusiasm?” If you’re bored by worship that’s saturated with Scripture, the problem isn’t the liturgy; the problem is you and me! We don’t prepare to meet with God in public worship; we don’t appreciate its blessings. In fact, changing your church’s liturgy just for the sake of change can actually do more harm than good. In my first year of planting the church I now pastor, I would change the parts of the liturgy almost every week. Then a father of two young daughters came to me and said his daughters were confused, lost in worship, and not able to participate because they didn’t know what would happen. Utilizing set forms actually equips us and our children to participate with understanding and passion. Teach your people why you’re using a liturgy and its meaning. Highlight various aspects of the liturgy in sermons and Christian education. Linking our theology to our liturgy is natural and necessary. When we preach or teach on a text like Psalm 51 what greater time to speak of why we read the Law, confess our sins, and receive absolution every week? When we teach Sunday School on Peter’s confession of Christ in Matthew 16 what better time to speak about why we recite creeds? Repetition is the mother of skills. Evangelical Christians needs to learn this is true in worship. Learning this lesson may be painful and take some time to get used to, but the reward is a worshipping congregation. Just think about what you and your congregation will be able to say God in any circumstance of life after learning your church’s theology methodically over the years. Think about the children in your congregation who will one day be its leaders and the parents of another generation. They—and you—are never too young or too old to begin learning through weekly worship the Bible’s theology. Pastor of the Oceanside United Reformed Church in North San Diego, California, author of 19 books, adjunct professor at several seminaries, and PhD student.